“December and January’s temperatures dipped to the teens and single digits, and the result is much higher electric bills than expected,” says Duck River Electric Membership Corporation (DREMC) CEO and President Michael Watson. Watson explains that in comparing temperatures of the first 25 days of Jan. 2017 to that of Jan. 2018, daily lows averaged 42 degrees last year; in 2018 the daily low temps have averaged 25 degrees. From Jan. 1 to Jan. 25, DREMC had logged a total of 18 days where low temps were at 32 degrees (the freezing mark) or below, with three of those days dipping into the single digits. As compared to this same period last year, only six days reached freezing or below. The Tennessee Valley Authority (TVA), which provides electricity to DREMC, twice initiated a “voluntary curtailment of energy use” across its seven-state region to help control energy demand during the worst of the low temperatures recorded on Jan. 3 and Jan. 17. According to TVA officials, on Jan. 17 when low temperatures plummeted to 5 degrees, TVA reached an all-time daily energy record of 706 gigawatts sold valley wide. On Jan. 18, DREMC’s peak load reached 533.9 megawatts (MW), which was more than 100 MW higher than the Dec. 2017 recorded peak demand. On Jan. 25, as normal temperatures returned, DREMC had logged 377 MW for daily demand. According to co-op officials, the average hourly demand for the DREMC area is between 200 to 300 MW. In monitoring weather predictions and calculating peak load, DREMC activated its Beat the Peak™ Alerts four times over the last two months asking members to reduce energy use to help avoid higher energy costs associated with TVA’s peak demand and its accompanying demand rates. Conserving energy use during the winter peak hours is helpful in avoiding higher energy rates charged by TVA to DREMC who must then pass those rates on to its members. DREMC offers helpful energy-savings tips and payment plans to assist its members in controlling monthly electric bills. Call your local DREMC office for details. Brochures and information are also available at co-op offices and on our website. For a limited time, DREMC, in partnership with TVA, is offering an attic insulation rebate through the end of February. The co-op states that air sealing and proper attic insulation are two easy ways its members can improve the energy efficiency of their homes and help reduce electric bills. For more information about the attic insulation rebate offer, call or visit your local DREMC office or click here. Duck River EMC, a Touchstone Energy® cooperative, is a not-for-profit, member owned organization providing electric and other services to more than 74,000 homes and businesses in southern Middle Tennessee. Duck River EMC serves an area of approximately 2,500 square miles in Bedford, Coffee, Franklin, Giles, Grundy, Hickman, Lawrence, Lewis, Lincoln, Marion, Marshall, Maury, Moore, Rutherford, and Williamson counties in southern Middle Tennessee. The charts above illustrate how much colder this January has been than 2017. Two stretches of frigid temperatures well below 30 degrees affect heating costs and drive up electric and gas heating bills. Heating and cooling systems are large energy consumers, accounting for 30-40% of a household’s overall average electric use each month. 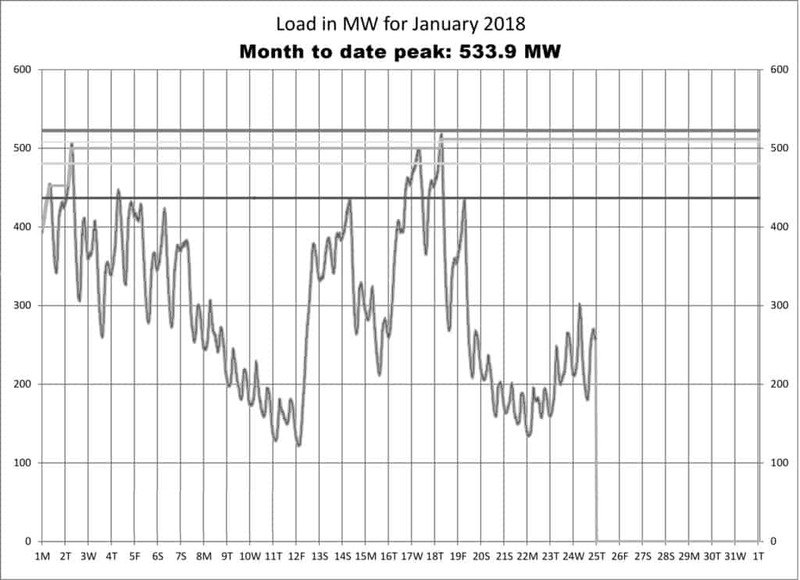 The chart here illustrates DREMC’s peak electric load, which occurred on 1/18/2018 when the temperature hit a low of 4 degrees.